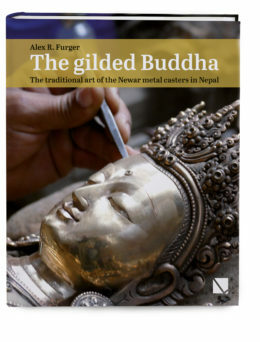 This book celebrates in words and images the traditional metal crafts practised for over a thousand years by the creators of religious Buddhist statues in Nepal. The skills of these artisans are nurtured with deep respect for tradition, regarding religion, iconography and technology. Wax modellers, mould makers, casters, fire-gilders and chasers are among the specialists of the Newar ethnic group, whose work is characterised to this day by a melding of age-old technology, great skill, religious observance and contemplation. There are numerous books and exhibition catalogues dedicated to Buddhist art and iconography but little was available about the craft of the artists who turn the religious imagery into metal casts. This book fills this gap, with a thoroughly documented and historical account of the development of this “archaic” technology. The well-informed text and comprehensive photographic coverage constitute the only up-to-date account and full documentation of an art that is 1300 years old but dying out: the “ritual” production of Buddhist statues in the lost wax casting technique. The author, Dr. Alex Furger, is an archaeologist who has studied ancient metallurgy and metalworking techniques over the past four decades. He spent twenty-five years at the head of the Roman site of Augusta Raurica and lives in Basel (Switzerland). He is the author of over 130 articles in scientific journals and twelve books in the field of culture history. The fieldwork for this book led him repeatedly to Nepal, where he met and interviewed dozens of craftsmen in their workshops. This book is addressed to readers interested in culture history, travellers to Asia, collectors of statues of Buddha, (avocational) metalworkers, historians of technology, Buddhists, ethnologists, archaeologists, art historians, scholars of Asia and to libraries and museums.